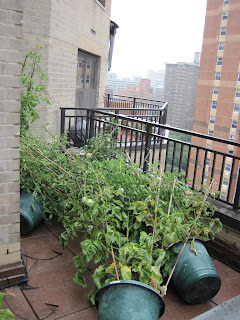 ﻿﻿ Hurricane Irene came at us with her 75 mile an hour winds and driving rain, but we had a plan to protect our tomatoes - and it worked! First, we picked off all the ripe and even partially ripe fruit. But then, instead of striving to keep our 6 foot plants standing through the storm, which was our initial instinct, we laid them on the ground beforehand. This way, the wind barely reached them and couldn't shake the tomatoes off the vines. We had to be very gentle as we lowered them so that the branches didn't crack. And we needed to criss-cross them in order to have room. But it was worth it. The plants are still in tact and we only lost a few green tomatoes in the process..
With the wind lasting through Sunday, we kept them grounded most of the day and picked a couple up on Sunday evening. The rest we raised on Monday. I'm relieved to say that they made it through the gale in fine shape and we expect to have tomatoes right through Sept. In case you haven't heard, There is a hurricane coming. I just wanted to send out a note to everyone with some helpful tips in keeping your plants safe. For those of you with balconies, it may be a good idea to put your lighter plants and plastic furniture inside. With 50 to 100mph winds, anything light that that is left on a balcony will be blown away. Don't worry about the plants that are in big heavy pots, if you have trouble moving them then they are probably fine. Put everything as close to the building as you can. The same rules apply to roof top gardens as well. Remove the covers from your gazebos and take down any umbrellas and store in a safe place. Remove any window boxes that are hanging on railings and put them inside or on the ground. Take down any hanging baskets and put them inside. Stake and tie plants in your garden. Try to secure your plants as best as you can but remember that they may not survive the storm. Take the time to harvest any vegetables that are ripe. Harvest any tomatoes that are close to maturity. Pick the large green ones too and see the recipe below for Fried Green Tomatoes. Don't forget to cut some flowers and bring them inside. Chances are they won't be so nice after Irene rolls through. Flowers will make even the dreariest day cheery. If you have any garden ornaments, plastic lawn furniture, chimes, empty pots, garden tools, ect.. outside, secure them and take them inside. They will be blown away. Time for fried green tomatoes! Here's my mother's recipe. Use firm green tomatoes that arn't too ripe or they will be mushy. 1. Slice the tomato into thick 1/4" to 1/2" slices. 3. Dredge in flour that is seasoned with salt, pepper and paprika. 4. Fry in an iron skillet using bacon fat on medium heat for about 3 minutes on each side or until browned. Sprinkle a little kosher or flake salt on top and serve warm on a sandwich, or on a plate, doesn't matter, they are tasty. Sometimes she would sprinkle Old Bay and a little vinegar on them, but then again almost everything we ate had a little Old Bay and vinegar on it. It's time to batten down the tomatoes! Hurricane Irene is coming to NYC, with lashing rain and strong winds. This could mean a tomato disaster if we don't take some important steps. Our tomatoes are grown in pots and even medium strength winds can knock them over. This year, we've made great strides in preventing that by tying them to the railing with twine. To further stabilize the plants, we've tied strategically placed tomato poles to the railing too. We've also placed heavy, soil-filled pots alongside some of the tomato plants to prop them up. But with Irene bearing down, we will go further. We plan to cut back tall branches that have already been picked clean, to provide less lift, even if that means losing some flowering stems. I always hold out hope that those flowers will turn into ripe tomatoes, but with summer sun and heat diminishing, even I can admit that for the biggest varieties, like Brandywine and Cherokee, this is unlikely. I made a cucumber gazpacho last week from the last of my fresh grown cucumbers and it was truly delish. 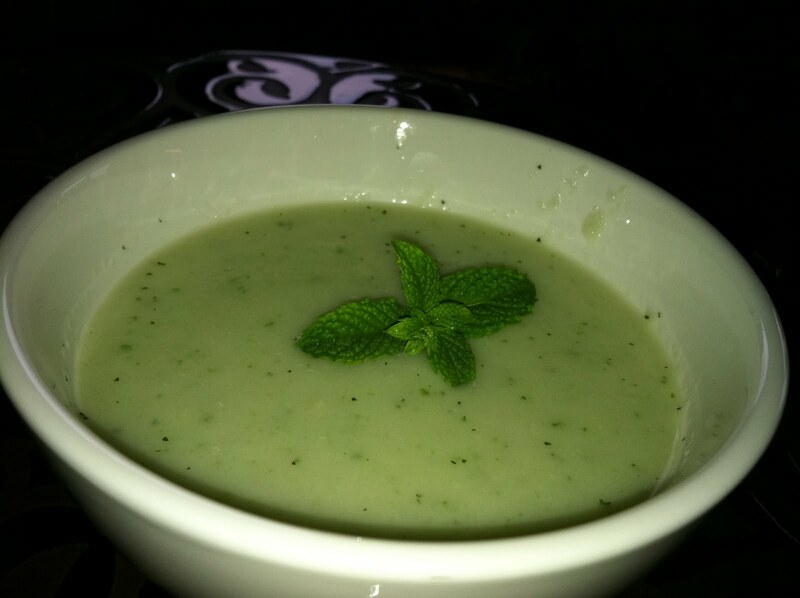 I especially liked this recipe because it uses fresh mint, which is also growing in my garden. The soup is so refreshing on a hot summer day. And so easy to make! Using a mild jalapeno pepper gives it just enough kick. Sadly, my cukes dried up during the heat wave. The vines seem to be coming back now, but it's too early to tell if I'll get anything more than a few flowers that never develop into fruit. That won't stop me from heading to the market and buying fresh cucumbers to make another batch. 1.Step 1: Place all ingredients in the bowl of a food processor with 1/2 cup of the spring water. Pulse a few times so the ingredients are coarsely chopped, then process until soup is very smooth, about 2 to 3 minutes. If necessary, thin with the remaining water to the desired consistency. 2.Step 2: Transfer to a bowl and refrigerate 2 hours or overnight, until well chilled. Place the soup in the freezer for 30 minutes before serving. 3.Step 2: Ladle soup in chilled soup bowls or cocktail glasses. Drizzle a little lemon oil in the center of each bowl. Garnish with a few tomato cubes, a mint leaf and serve immediately. 4.Cook’s note: The soup can be refrigerated up to 2 days. Holy Tomato - This baby is two pounds! After a tough beginning battling blossom-end rot, worms and a withering heat wave, we have tomatoes. Our Chocolate Stripes, Cherokee Purples and Aunt Ruby's Greens are ripe, juicy and delicious. But the Brandywines are the biggest! Check out this two-pounder. It's by far the heaviest tomato we've ever grown. Perfect with mozzarella and basil. Mmmm.